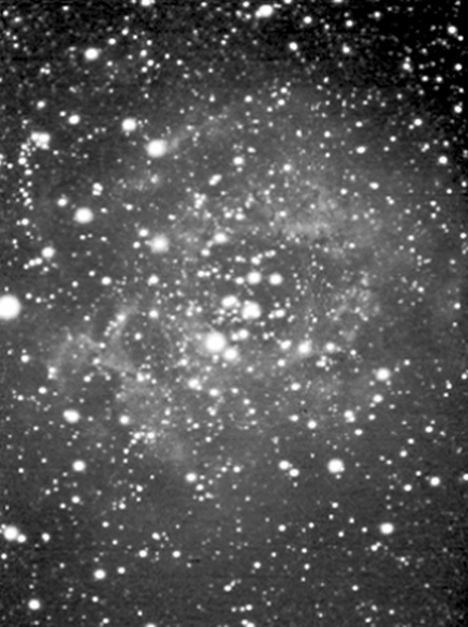 The star cluster NGC2244 and the associated nebulosity known as the Rosette Nebula in Monoceros. It is the brilliant O class stars highly energetic in the short wavelength ultra violet that excites the hydrogen gas cloud. The highly energetic solar wind from these O class stars are creating a bubble in the gas cloud , eventually blowing the cloud apart. Telescope aperture and focal ratio: Tamron 300mm f5.6 lens. Lumicon photographic Ha filter. Starlight Express MX916 CCD Camera. Seventeen minute integration.